Despite being abandoned over a long, hot weekend, our little twenty-four-pots-on-a-second-story-apartment-balcony garden seems to be progressing quite nicely (except for my hanging plant of strawberries, which seem to have been DOA). The daisies are blooming again; we've eaten the spinach in salads a couple of times; the tomatoes are finally flowering and Steve sampled some onion last night after he removed fifteen little green worms from the broccoli. Ew. We hope the plant will survive but right now it doesn't look pretty. 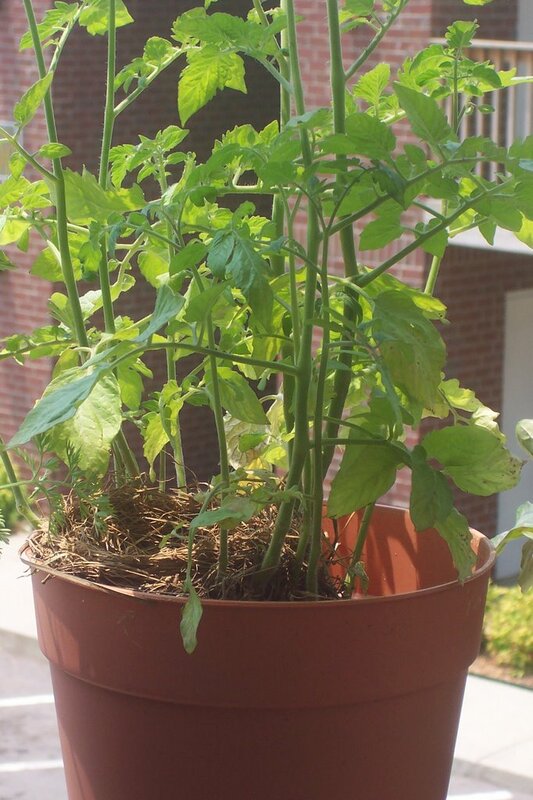 To our surprise, we discovered when we got home Monday night that some birds had decided our larger tomato pot was a perfect place to build a nest! Figuring it wouldn't hurt the tomatoes and not wanting to disturb their hard work (I am amazed at the work these little birds can do! ), we left it alone. 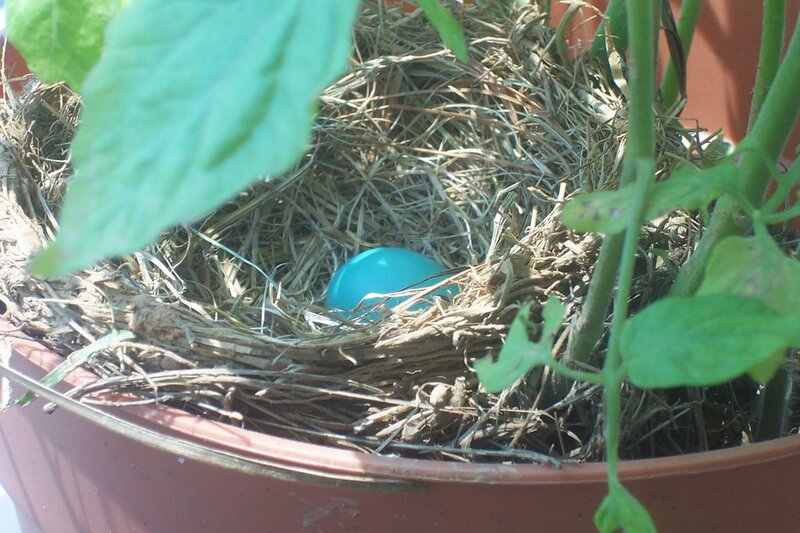 Then this morning I found a robin's egg in the nest! 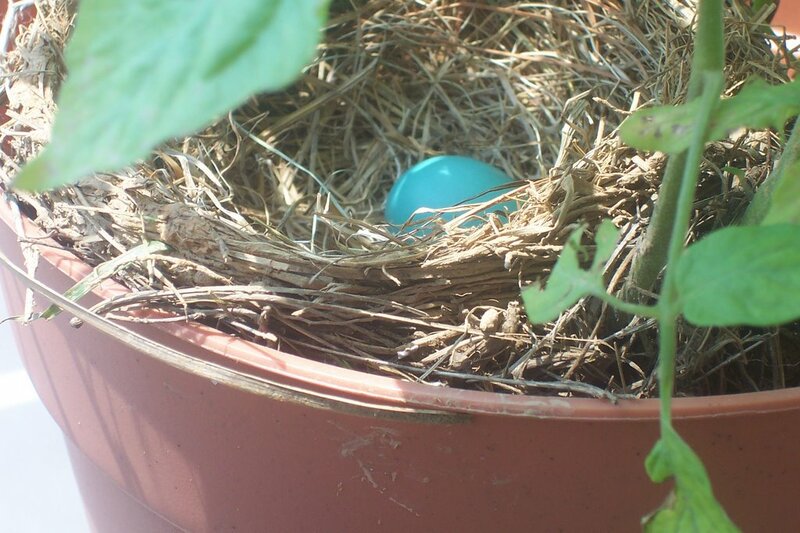 Did a little searching on the web and it looks like we'll see at least one baby robin in a couple of weeks! ...We confess that we are not willing to pay the high cost of discipleship. We try to be as worldly as we think we can get away with. We prefer to squeeze our faith in around the edges of life, rather than to let you stand at the center to control everything we are and have. ...We confess that we lack compassion. We think it is important to help the poor, provided that someone else actually does the helping. I was again reminded of the Greek word for "confess" (homologeo), which means "to say the same thing." Imagine if we regularly said the same thing that God says about our hearts, flesh, attitudes, desires, demands, and idols. "God, deliver us from sinful spin." Read the whole thing, and take a moment to pray through it rather than quickly skimming. Funny how immediately after you learn something, you see just how much you haven't learned it at all. Shortly after my little revelation about Philippians 4 and my struggle to see evidences of grace, Steve had to call me out on "being negative." I knew I was feeling irritable, but I hadn't realized just how negative I'd been: In the space of an hour or so, I'd lamented that my haircut was uneven, rejected his suggestion of a vegetable for dinner, complained that the baked pineapple I'd made was overdone, and declared my chocolate chip cookies "lousy," among other things. Nice. Real fun to be around. Real grace-filled, Ame. "I am learning that people need ten words of encouragement for every word of admonition. God's people lose heart more quickly than they lose their map." I realized a strange irony: God has graciously given me the spiritual gift of exhortation--as affirmed by tests, experience, and other Christians. Yet one of my besetting sins seems to be a prideful, critical spirit. In one sense this seems totally incongruent, even impossible. On the other hand it makes perfect sense. Of course Satan would attack in a way designed specifically to counteract a primary way God has designed for the Spirit to work through me. He is a JERK!! But: He who is IN me is far GREATER than he who is in the world (1 John 4:4). Satan has already been defeated--he is on a leash--and one day he will forever be destroyed! "The God of peace will soon crush Satan under your feet" (Romans 16:20) ! The growth is slow going, and I often feel frustrated at my lack of progress. But I know I've come a long way in the last nine years. And it gives me so much hope and excitement to know that though I struggle, Satan cannot prevail against me. God has promised to bring to completion the good work He began in me! One of the worst ways the ugly pride in my heart manifests itself is through a critical spirit. My default mode is to look for error; I am, after all, an editor. I have trained my eyes to see what's wrong, what's ugly, what doesn't work. I set out to find the mistakes. I have been a perfectionist my whole life--and so my sharp eyes examine carefully to spot flaws, traces of imperfection. "Are you frequently critical of others? Do you look at those around you only to find one blemish after another? This proud tendency is a deeply rooted habit for many of us who have sown seeds of self-exaltation over the years." Mahaney explains that identifying evidences of grace in others--"actively looking for ways that God is at work in the lives of other people"--is crucially linked to humility. "Only those who are humble can consistently identify evidences of grace in others who need adjustment," he says in the book. "It's something the proud and the self-righteous are incapable of." So God has exposed this sin in me--the pride that surfaces in a critical spirit. But how do I learn to "identify evidences of grace"? I've been asking Him to change my perspective, to give me new eyes to see myself and the world around me. It's clear to me that I desperately need the Spirit's gracious work of transformation; left to myself, I settle back into the habit of fault-finding. I am an expert at this sin. But if I am skilled at finding fault, I want to become even more adept at finding grace. "Wherever faith looks, it sees grace behind every praiseworthy act. ...Whatever goodness faith sees, it sees as the fruit of grace." I've often heard this verse quoted in arguments and debates about what's acceptable for Christians to watch/read/listen to/etc. I think it's deeper than that. I think it's about noticing. I think it's about taking note of the truth, the nobility, the rightness, the purity in the ordinary people and things and events in my everyday world. I think it's about pausing to notice the lovely in the common instead of noticing the ugly in both. It's about looking for something to admire instead of something to criticize. It's about looking for something praiseworthy instead of something to nitpick. And it's about praising the gracious, glorious Savior who is the Source of all that's good. I am quick by nature to see what's distasteful, what's broken, what's substandard. Lord, transform my vision. Make me quick to see what's pure, true, noble, right, excellent, lovely, admirable, praiseworthy. And then teach me to see in these things grace. "When I was young I was harsh and critical because I did not know my weakness." Whew. Full post is here. I've said it a thousand times, I'll say it again--get this blog on your feeds. I'm a little late to weigh in on Mother's Day, but I laughed out loud at this wrap-up: 2nd graders weighing in on a variety of questions about moms. Hilarious. Here are a couple of my favorites--full list is here. 2. Magic plus super powers & a lot of stirring. 1. God makes mothers out of clouds & angel hair & everything nice in the world & one dab of mean. 3. Does he make at least $800 a year? Did he say NO to drugs & YES to chores? Go check out the rest for a good laugh! Between who I am and all I aspire to be..."
--Nichole Nordeman, "Take Me As I Am"
"I am tempted to discouragement -- I look at myself and think: 'This is as good as I can be after 35 years in Christ??!!' But then I ask the help of others and discover that they are the same! And then I am reminded by one of those others that my hope is not that I shall be well in this life -- but that Christ was well for me -- and that to be discouraged with myself is to have believed in myself -- and that is the opposite of the Gospel." Steve and I have signed a contract on a house! We made an offer last night, the seller countered, and we accepted--so, if the Lord wills, we will close June 30 and spend the month of July moving into our new house!! It's a great old house (built in 1938) that's completely livable now, yet has plenty of projects to keep us busy. We are so excited about becoming homeowners! Working on importing a snazzy Flickr slideshow here--but if you're so inclined, you can see the pics now by clicking here. David is dying. His son Solomon has already been named as the one who will inherit the throne. But the rebellious and prideful Adonijah has other plans, and sets himself up to become king. In the introduction to the story, the author of 1 Kings inserts the statement above as a parenthetical explanation: "Why Adonijah Turned Out Bad." True, perhaps. But this morning one little word leaped off the page at me: WHY. It doesn't say, "His father had never interfered with him by punishing him for his bad behavior." It says his father had never interfered with him by asking, "WHY do you behave as you do?" The more I've learned over the last few months about gospel-centered living, the more I've begun to understand how crucial it is to look for the "WHY" behind the "what." The fact is, wrong thinking underlies wrong actions. Sin is not a behavior problem; it is a heart problem. And if you dig deeply enough, you'll find that at the root of your sinful actions is a flawed thought pattern. Buried beneath the pride, or the anxiety, or the jealousy, is some sort of unbelief--a misconception of God's character; a failure to trust Him; a lack of faith in His promises of future grace. As John Piper says in Future Grace, it's bad news--the sin is more devastating than you thought; its roots are embedded far more deeply in your soul than you realized--but it's good news. For when we discover the real problem at its core, we can apply the gospel and trust the power of the cross to pull the sin up from its roots--rather than cutting off the weed only to have it spring back again. But these "solutions" doesn't cut at the root of the sin. They're like taking an aspirin to heal a headache caused by a brain tumor. Aspirin may seem to bring relief to the situation, but it's a temporary fix. Only cutting out the tumor can truly solve the problem--and only the gospel has the power to destroy the cancerous tumor of sin. We must dig deeper. We must treat the cause and not just the symptom. Why am I so full of lust? Why am I slothful and completely unmotivated? Why do I seek to cover up the truth? Somehow, the heart of the matter is that I act the way I do because, regardless of what I profess to believe, in some way I don't practically believe that God is who He says He is or that His promises are true. And when I, Lord willing, become a mother someday, I don't want to be the kind of parent David was. By the grace of God, I hope that I won't just congratulate myself on a job well done when I discipline my children and punish their bad behavior. I pray that I'll apply the gospel and shepherd their hearts--that I'll get at the "WHY" behind their sin so that they can walk in that same cancer-free joy and freedom, thanks to the cross. I spent quite a bit of time a few months ago raving about the book. Now I'm going to rave about the CD. I'd be doing you a disservice if I didn't. It's been around for a couple of years, but it's brand-new to me--and, I'm guessing, unheard-of to most of you. Unfortunately Sovereign Grace Ministries seems to be, in many circles, one of the best-kept secrets in the church today. As I've listened to this CD after buying it last week, I'm blown away by the realization that real churches actually sing songs like these. Why doesn't every church sing songs like these?? I've ranted in the past about the shallow self-centeredness of many (most?) modern praise & worship songs. Every line is about how I feel and what I'm going to do. Not exactly helpful for me to get my mind off of myself and delight in the glory of God. Yes, it's valuable to respond emotionally to God in worship. But too often we start with the emotions--they have no foundation in truth. I love the richness of the hymns...but those can sometimes have their shortcomings as well. Sometimes they're so packed with truth--or, sadly, they're sung so lifelessly in a church service--that it's all too easy to breeze through the words without really reflecting on what you're singing. Enter these beautiful songs. They're saturated with biblical truth, proclaiming over and over the beauty and glory of the cross. They're sung passionately, exuberantly. Important choruses are repeated, making them easy to learn and reflect on. And hearing these profound proclamations of the gospel naturally stirs up those responsive emotions of joy and gratitude in me. You might love the style of some songs and others might not be your favorite. Some vocal styles might bug you; others might strike you as fantastic. But I'd bet that pretty soon, you won't even notice or care--you'll be caught up in worship. The power of this music transcends the style, the vocals, the instruments. It's not about any of that--it's about Him. Ahhhhh. So refreshing. "'My heart is filled with a thousand songs proclaiming the glories of Calvary.' This line from the chorus of 'The Glories of Calvary' by Steve and Vikki Cook explains why we produced Songs for the Cross Centered Life. Using various musical styles ranging from Celtic to pop, from classical to gospel rock, we extol the glories of the Lamb who was slain for our sins. ...Our prayer is that as you listen, you will be drawn to worship the Savior whose cross will ever be the center of our lives." We are so forgetful--and rather than letting the cross fade into the distance in our rearview mirror, we need to be constantly directing our focus back to the main thing. This CD equips me to do just that. As C.J. Mahaney explains in the book, "A Christian's heart should be brimming every day with the song of Calvary. ...There is no better way to start each day than to employ songs and hymns that speak of the cross with clarity and power." Just writing about it right now gave me the urge to be listening to the CD yet again. So I am. I love it! You can order Songs for the Cross Centered Life here. You'll be doing yourself a huge favor if you head over there right now. It's well worth the money. schmamy - what more could you want? It's time to think about schmamy. schmamy - a safe place in an unsafe world! Can you feel it? schmamy. schmamy - forget the rest. schmamy - once you have it, you love it. schmamy is what the world was waiting for. Which one's your favorite? Better yet, go make your own, and comment back here! This video is amazingly hilarious. Who knew Dalmatians could ride bicycles? Anyone know of good places in the area (north side) to pick strawberries? Also, anyone know of good roadside vegetable/fruit stands in the spring and summer? And does ANYONE around here grow rhubarb??? "Most Americans believe that what their problem is is something has happened to them and that the solution will be found within. They feel that they have an alien problem to be resolved with an inner solution." In other words, something happened to me. I am a victim. The solution is found in the depths of my heart. "The Bible says that we have an inner problem with an alien solution!" The gospel reveals the depths of the sin in our hearts. Our problem is within us, and it can only be solved outside of us-through the sacrifice and righteousness of Jesus Christ. I got saved the way so many of us in America do. I came to Jesus to get out of Hell, to avoid being squashed by demonic forms of transportation and sent to the bad place where I'd be forced to wear drab clothing and chains for all of eternity. I repeated a prayer after a pastor and "invited Jesus into my heart" and asked him to be my "personal Lord and savior" - my personal bodyguard saving me from harm and hell. I had no idea that what I should fear the most, what Jesus saved me from first, was neither trucks nor hell but me. ...what Jesus wants us to understand first is just how messed up we are. Poor in spirit. Jesus saves first and foremost not from external dangers but from internal demise. He saves first not from future torment but from today's depravity. Only Jesus saves. He saves us from the natural disaster of sin within the human heart. He provides the only hope of healing with one act of sacrifice two thousand years ago outside Jerusalem's gates (Romans 5:12-15). Jesus saves us...from the source of all that has gone wrong and is going wrong everywhere and with everyone: misguided emotions, corrupt minds and selfish wills. ...the promises of future grace are the keys to Christ-like Christian living. ...By future I do not merely mean the grace of heaven and the age to come. I mean the grace that begins now, this very second, and sustains your life to the end of this paragraph. By grace I do not merely mean the pardon of God in passing over your sins, but also the power and beauty of God to keep you from sinning. By faith I do not merely mean the confidence that Jesus died for your sins, but also the confidence that God will "also with him freely give us all things" (Romans 8:32). Faith is primarily a future-oriented "assurance of things hoped for" (Hebrews 11:1). Its essence is the deep satisfaction with all that God promises to be for us in Jesus--beginning now! This is another theme I've been pondering for several months now that Piper fleshes out beautifully, more completely than I did or could. It began when I started reading Adventures in Missing the Point (which I never did finish) and considered McLaren and Campolo's claims that Christianity is not solely about being saved from hell. I recognized in their assertions the mindset of much of conservative evangelicalism: to mix my metaphors, the world is going to hell in a handbasket, so jump off the sinking ship and paddle like mad to get as far away as possible until Jesus takes you home. In that and in Nichole Nordeman's song "Live," I recognized that there has to be something more. Faith in Christ is for NOW--it is for abundant life on earth! It is not just about "fire insurance," about biding time and knowing that someday you'll go to heaven. It is following Christ passionately and living a cross-centered life here and now! It is turning your world upside-down and living not for yourself, but according to the values of God's Kingdom TODAY! So I love seeing Piper develop this idea in such a Biblically-saturated way, and I am excited about where this book will go. "Faith in future grace" is not just believing that one day you will go to heaven and not hell becaues of Christ's sacrifice--though that is a beautiful, glorious truth! It is believing that the God who forgave your sins has the power and can be trusted to sustain you each moment--to set you free from sin more and more each day--to provide everything you need until you get to heaven! “Let the little children come to me,” Jesus said, “and do not hinder them, for the kingdom of heaven belongs to such as these” (Matthew 19:14). and God is passionate about them. Yesterday, along with churches all across America, we observed Compassion Sunday. I want to take a few minutes on my blog as well to focus on the millions of children around the world who live in extreme poverty—unable to attend school, constantly exposed to hunger and disease, and all too often neglected or abused. Most of all, they lack hope. The numbers can be overwhelming—you might not know where to begin or whether anything you could do would actually make a difference. But what if you knew one of those children by name? What if you had a vital connection that allowed you a unique opportunity to help that child? "Poverty, an overwhelming global tragedy, occurs one life at a time. It destroys lives one at a time. And it is defeated one life at a time." (Wess Stafford, Too Small to Ignore) You can't change the whole world. But you can change the world for one child. Jesus held children so close to His heart that He said in Mark 9:37, “Whoever welcomes one of these little children in my name welcomes me; and whoever welcomes me does not welcome me but the one who sent me.” When we reach out to children living in poverty, we reach out to our Lord Himself. For the past 50 years, Compassion International has been reaching out to needy children around the world. Through sponsorship, Compassion links you to an individual child who needs your help. You receive his or her photo and personal story, and can build a relationship with that child through letters and prayers. I believe in the ministry of Compassion. They see children as Jesus did. They realize that though children are the littlest in society, often overlooked or dismissed as “our future,” children are important to Jesus today. I’ve been inspired and humbled by my involvement in this vital ministry. I pray that through my letters and support, Leni is experiencing God’s love in a tangible way. And I get excited when I think about how God can use her to make an impact on her world, for His glory. Scripture leaves no doubt that we are called to live out our faith by caring for those in need. Sponsoring a child through Compassion is a simple yet powerful way to impact a child’s life for the Kingdom of God. What are you waiting for? Head on over to Compassion International's website and sign up to sponsor a child today! Did your church celebrate Compassion Sunday? Do you sponsor a Compassion child?